How Do Braces Work to Straighten Your Teeth? We’re known locally for our Invisalign treatment, but many Gorman & Bunch Orthodontics’ patients also choose braces. So how do these metal brackets and colorful bands actually work? Great question! Why is it so important for you to floss your teeth while in braces? First, let’s discuss the pieces and parts in a full set of braces that work to straighten your teeth. These are made of metal or ceramics. We use dental bonding material — really strong glue that keeps the brackets in place over the course of your treatment — to attach them to each tooth. This is the thin metal wire that runs between each bracket and puts pressure on your teeth in order to become aligned or straightened — whether it’s up and down or side to side. The elastic ties — also known as elastic rings, ligature elastics, or donuts — hold the archwire to the brackets. Our patients love these pieces because they come in an endless variety of colors! Each time you come into one of our Central Indiana offices to get your braces adjusted, you get to choose a new style. Depending on your bite, we may use rubber bands or elastics that hook from a bracket on the upper teeth to a bracket on the lower teeth. These create additional pressure to straighten and direct your teeth and jaw into proper alignment. In some cases, there are other tools we may use during your treatment, such as tubes, hooks, loops, springs, steel ties, and headgear. But don’t worry, we’ll keep you informed every step of the way. Your braces do more than rearrange your misaligned teeth. In fact — through a process called bone remodeling — we apply constant, gentle pressure against your teeth that actually encourages your bones to adapt and hold your teeth in their new positions for the rest of your life. Here’s how it works. The bracket and archwire work together to align each tooth into proper position. When we first place your braces, we use a narrow, flexible archwire, as your teeth ease into the new force and pressure. Then, as your teeth become straighter, we eventually use thicker archwires that fill more of the brackets’ slots and provide additional pressure. Once your teeth move to the right spot, we hold your teeth in place while the bone tissue around your teeth and jaws changes. And voila, your new and improved smile is set in place! It usually talks about three days for the bone remodeling process to start. You may feel some soreness in your mouth the first few days or weeks as your teeth and jaw get used to this new pressure. Once the process is in place, it takes about three months to grow new bone, and then generally 1-3 years to fully stabilize. This is why retainers are so important! Proper dental hygiene during your treatment will make your individual process the most efficient. Flossing between each bracket is extremely important, as well as brushing every curved angle around gums and brackets. We, of course, discourage chewing hard candy and gum (unless it’s sugar-free gum), and encourage eating some foods in smaller bites, like slicing an apple instead of biting into it directly. 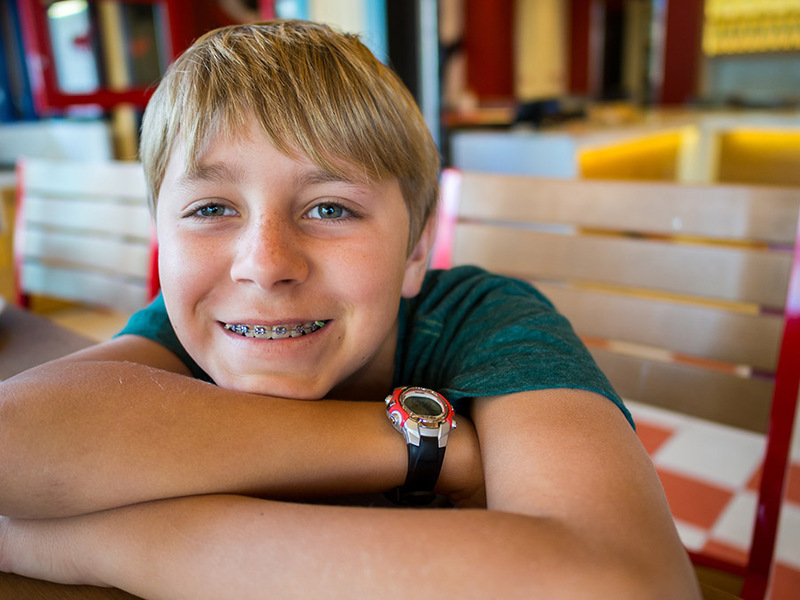 We follow the American Association of Orthodontics guidelines that recommend an orthodontic evaluation for every child by age seven or sooner. Our First Phase Evaluation helps us determine the best time to begin any necessary treatment and allow us to watch growth patterns as your child develops. If you think you or a family member are ready to talk about orthodontic treatment, reach out to us today and let us help you take the first step toward a happier, healthier smile.